Ok, so I think we're all finally better. There will be NO MORE SICKNESSES at our house. He's back to messing up, I mean playing with, the new baby's things. And back to eating entire apples. He eats them top to bottom, right through the core. Now if I could only figure out how to sew, I could finally finish my project for the new baby. I just get so clumsy and messy with pins, irons, needles and thread. And I am back to one of my favorite activities, Craigslisting. I just made the Craigslist purchase of a lifetime!! I will post about it when the item is in our house ... oh, I can't wait!!! This can't last much longer. ...I would not make it. Carson's eye infection/nasty cold are still in full force. I can't remember what my child looks like without liquid pouring out of every orifice of his face. And today he added a fever to the mix. I think the worst feeling in the world is holding your miserably sick child, being unable to console him despite trying everything you can think of, fully convinced that it's your fault he's sick, and deciding that his development will be forever altered because of the traumatic illness. Maybe that's a little dramatic, but that's how I feel when I'm holding my sad, sad baby. Thank goodness he sleeps through the night even when terribly sick. I was busy enough all during last night nursing my own sore throat and headache. And I thought my last few weeks of pregnancy would be spent resting up for the big day. Ha! So thank you, sweet child number two of mine, for NOT following the example of your big brother and arriving 3 weeks early. Please, please give us some time to get healthy, clean our now germ-infested home, and rest up for your arrival. And maybe even give me a few more days to make some freezer meals and finish my little sewing project for you. I am obviously in no hurry to have this baby. If you were to judge by the size of my belly, however, you may be convinced that he's either coming tomorrow or somehow the ultrasound missed his twin in there. I'm to the point where I walk past a strangers in the grocery store and can almost see the thought bubbles coming out of their heads, "Whoa; she's about to POP!!" Rick took an impromptu maternity photo shoot of me on Sunday. In the kitchen, him telling me how to pose. I was too embarrassed to post any pictures at first, but decided to just show it off with pride. So, there you have it, extra large baby and me at week 37. Or should I say baby and extra large me at week 37? Regardless of who's big or how big, let's just keep this little guy in me a little longer!! goopy eyes = a sad, sad baby = a very tired mom with goop encrusted all over her shirt. and now we're supposed to apply a thin layer of an antibiotic cream inside the lower lashes of his eyes 3 times a day for a week. yeah, tell that to a screaming baby who's squishing his eyes shut and thrashing all around. the positive side: at least this happened before the arrival of the new baby! time to wash and sanitize everything AGAIN. Rocky, I mean Ricky, Intramural Champion! 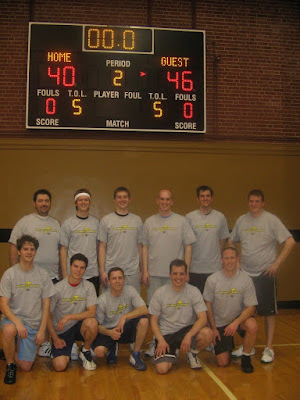 Rick's team won the intramural championship game last night! And I got to go watch him play for the first time in a very long time. They were down the entire first half, but I wasn't worried. Since we'd just watched Rocky, I knew it was better to be the underdog. Rick had a couple of fancy steals to start out the second half, for which I decided he gets defensive player of the game. They were on fire from there on out, and we won!! I am still SO sad I forgot to bring our camera, but at least Melissa shared the team picture. Until I married Rick-o, I thought Rocky was some strange guy movie that involved way too many sequels, sort of like Land Before Time. (Don't they have seven??) More importantly, I was certain I would never engage in watching any Rocky movie, under any circumstance. During the course of our 2.25 year marriage, Rick has frequently mentioned how nothing fires him up more than watching an inspirational Rocky movie. As a symbol of my boundless support for my husband, I gifted him Rocky VI for Christmas, mostly because it was only $3 on Amazon. A couple of weeks ago, Rick convinced me to watch the movie with him, promising lots of treats and cuddling during the show. Rocky is really funny. He's hilarious. And nobody ever told me there was a love story! Yes, the movie is even inspirational, although I did close my eyes during the fighting scenes. Since this discovery, we've watched Rocky I, and last night, half of Rocky II. (We have to keep some sort of bed time here.) We might have to finish Rocky II tomorrow evening just before Rick's intramural team plays in their championship game, in order to have the fired-up juices at their peak. I would like to share my favorite quote from the Rocky movies so far: Rocky is explaining why he's interested in Adrian, the extremely shy girl who works in the pet shop. He says, "She fills gaps," to which his friend Paulie asks, "What's gaps?" Rocky says, "I dunno...she's got gaps, I got gaps, together we fill gaps." I like to cook; Rick likes to clean up. I talk and talk; Rick listens. I do puzzles and read to Carson; Rick plays ball and wrestles. I freak out; Rick calms down. I pack huge lunches; Rick eats a ton. I lose my keys, purse, wallet, etc. ; Rick always knows where they are. We had an absolutely wonderful time visiting with Rick's mother, and his aunts and uncles who are also in Crossville. Carson, as usual, didn't give anyone except his mother the time of day. He was usually found in my arms, where there is really not much room these days. He sort of perches right on my belly, sometimes causing some contractions. He also really showed off his muscles. Latest report from the studier: he and his study buddies all agreed yesterday that the many hours spent studying for this test have actually made them "stupider." I guess trying to cram in the information about every virus, bacteria, fungi, and parasite isn't terribly stimulating. Those are our future doctors! Latest report from the home-maker: I've got a list that fills up the front and half the back of a sheet of paper titled, "Projects for us to do together over Spring Break." We'll start with the reorganization of the linen closet... And, at the top of the list: lots of daddy time with Carson! The first molars are here. I can't believe how thick/bubbly/swollen his gums are back there. But he's a trooper, and I haven't heard too many complaints. Besides, more teeth means more eating adventures, right? When we moved here, Rick cheerfully declared, "well, we can leave our coats and scarves all packed up!" He had read that the average temperatures in the winter here are in the 40s. Even after I calmly explained the definition of the word average (if the average is 40, sometimes it's 55 and sometimes it's 25, right sweetie?? ), Rick still stuck to his guns that it would be perpetually spring. When we woke up this morning, Rick was not his usual optimistic self. "It's cold in here," he said, "and I haven't heard the heater turn on in a while." We attempted to turn on the lights. No lights. No electricity. NO HEAT. No microwave to make hot chocolate. It was 49 DEGREES IN OUR BEDROOM. So, Rick went to school (I guess somehow the hospital always has electricity and heat. Hmph. ), and Carson and I were left here to pile on layers of clothing and cuddle up, not daring to open the refrigerator. At about 11 a.m., the power came back on, of course causing our alarm system to beep loudly and wake up Carson, ruining my hopes of having a morning snooze as well. So, Rick, I guess it's a good think we did unpack our coats and scarves when we moved here. 'Cause Carson and I wore them all morning inside the house!